Why should you use a page description? The page description is what a search engine will show in the search results below the title of your page. So it’s very important to have a clear and attractive description that triggers the viewers to click on your link. You should use a page description/meta description to optimize your conversion rate. The meta description is the small piece of information in Google, right under your title tag in black, just like you can see in the picture below. 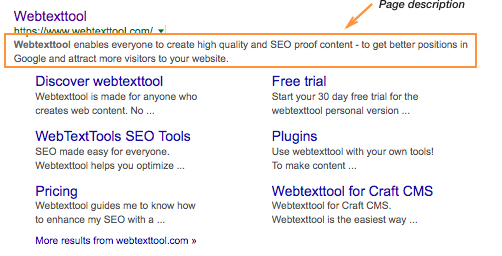 The orange arrow in the image below shows you where to write your meta description.